This is not another blog about Pink Floyd or a postcard from the seaside. ‘Wish you were here’ refers to an organisation that has taken the co-regulation journey, placed it at the heart of everything they do and stepped up to the QAS challenge – to externally validate their progress. Quality Assured Scrutiny is the unique accreditation award for social landlords’ co-regulation structures and it is provided in partnership by TPAS, CIH and HouseMark. In April 2014 AmicusHorizon signed up to undertake the accreditation for QAS. I was pleased to be appointed as the assessor because five years earlier I had undertaken some of the original training for the engaged residents at AmicusHorizon. In addition, over the years I have kept abreast of the scrutiny structures (diagram 1 below) at AmicusHorizon with its Residents’ Council, which had been a bold step change for an organisation that had not always embraced resident engagement or been known for its customer care. It wasn’t just about paperwork, I also sought direct face to face evidence through reality checks with engaged and non-engaged residents, board members and the executive team. It’s easy to talk the talk, but would the reality live up to the written words provided as evidence? operational staff, including Area Managers and Resident Governance Officers. So what did the reality checks reveal about AmicusHorizon? The first surprise was the transformation of the Croydon head office, from a 1970s-type communal block entrance I had visited several years earlier to a warm and welcoming front desk. The second surprise was the level of resident engagement that has been embedded in virtually every aspect of AmicusHorizon’s operation. The ‘One Team’ approach to drive up the organisation’s performance actively involves residents and places a focus on the key outcomes for them. 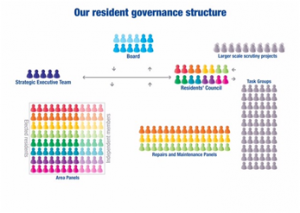 For 2014/15 every member of staff, including all the backroom service teams, has an action-related objective on resident involvement. There are no restrictions on the reports and information the Residents’ Council can request. 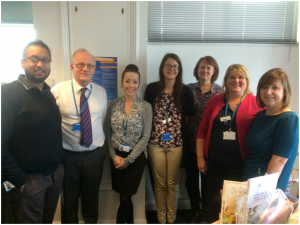 Small part of the Co-regulation Directorate with Resident Governance Officers (centre). We started the QAS process back in April 2014 with AmicusHorizon (lead officer Laura Bradley, Resident Governance Officer) tasked with completing a detailed self-assessment. My on-site reality checks and final assessor report with recommendations went to the internal TPAS, HouseMark and CIH verifiers in October 2014. AmicusHorizon was awarded the QAS Accreditation in November 2014. There will be many housing providers out there who would like to be in same position as AmicusHorizon. The QAS assessment took seven months to complete. AmicusHorizon and its dedicated residents had started the co-regulation journey process several years earlier.